Valerie (Val) La Porta-Haynes was born and raised in Henderson, NV. Her parents, fine artist Elayne La Porta, and father, Lou La Porta who has been actively involved in local politics since Henderson became a municipality in 1953, were among the first inhabitants of the city. Valerie is currently owner and manager of Elayne La Porta Fine Arts on Water Street where she oversees her mother’s extensive and highly sought after collection of paintings and prints. 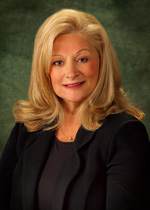 Prior to running the gallery, Valerie worked for the Clark County Department of Aviation in the Finance Division in Contracts and Purchasing. As a longtime resident, Valerie has wonderful memories of the town that grew up around her. Most Saturdays were spent seeing a matinee at the Victory Theater where movies like THE FLY delighted audiences young and old. She has fond memories of buying shoes at Van Valey’s and clothes at Kiddy Korner, Tally Ho, and Vernays, eating crumpets at The Cake Box, building stick forts and tree houses, and riding her horse with her friends and siblings. Henderson was the perfect “home town.” A family fully engaged in community service and spirit, the LaPorta’s attended and sponsored numerous parades and enthusiastically celebrated Henderson Industrial Days. Valerie attended St. Peter’s School, Bishop Gorman High School, Clark County Community College, and the University of Las Vegas. Dedicated to carrying on the civic spirit her parent’s instilled in her, Valerie is one of the Founders of the Henderson Historic Society and is deeply committed to honoring and sharing the city’s fascinating history. As part of her personal dedication to the HHS, Valerie hopes to promote cultural exchange and understanding, to increase the younger generation’s interest in the science and technology the town was built upon, and to give humanity a belief in the spirit of human innovation that is so strong it can literally build a town out of the desert sand.